Memorials at Aysgarth church reveal many connections with India, including the “Heroine of Cawnpore” – Ann Fraser who, before her marriage, was Ann Fawcet Wray. Also remembered among the Wray Memorials in the Lady Chapel of that church (see below) is her uncle, Lieutenant Thomas Fawcet Wray, who was killed during the storming of Badajoz in Spain in 1812, 17 years before she was born. In the nave there is another memorial to Lt Wray of the 7th Fusiliers erected in his memory by his fellow officers of the Loyal Dales Volunteers. On that it states that he died, aged 25, on April 2 1812. But other sources, including another tablet in the Lady Chapel, give his date of death as April 6 – the day that 4,800 allied soldiers were killed storming Badajoz. This has been described as one of the bloodiest battles during the Napoleonic Wars. The Earl of Wellington had reached Badajoz on March 16, 1812, and had 27,000 allied soldiers – British and Portuguese – under his command. They laid siege to Badajoz where 5,000 French soldiers were garrisoned. The walls were bombarded, tunnels were dug and extensive siege earthworks built until the Allies managed to breach the walls in two places. One more breach in the walls was created and, on the night of April 6, Wellington gave the order to make a surprise attack but a French sentry raised the alarm. French soldiers rushed to defend the city and Wellington’s force was almost routed. Lt Wray’s youngest brother, Octavius (i.e.the eighth son) would have been about 19-years-old, by then and may have started his medical training. By mid-1831 he was in India as a surgeon with the Bengal European Regiment and his daughter, Ann, was eighteen-months old. He died of a fever in Agra in 1836 leaving five children, the youngest, Thomas Charge Wray, being just two-years-old2. “Two or three days after the arrival of the tidings from Delhi of the massacre which had been perpetrated in the old city of the Moguls, Mrs Fraser, the wife of an officer in the 27th Native Infantry, reached our cantonments, having travelled dak from the scene of bloodshed and revolt. The native driver who had taken up in in the precincts of the city brought her faithfully to the end of her hazardous journey of 266 miles. The exposure which she had undergone was evident from a bullet that had pierced the carriage. “Her flight from Delhi was but the beginning of the sorrows of this unfortunate lady, though she deserves rather to be commemorated for her virtues than her sufferings. During the horrors of the siege she won the admiration of all our party by her indefatigable attentions to the wounded. Neither danger nor fatigue seemed to have power to suspend her ministry of mercy. The Indian soldiers (sepoys) at Cawnpore rebelled on June 4 and the British commanding officer, Major General Sir Hugh Wheeler, moved the British soldiers and the women and children to a hospital and the thatched building adjacent to it around which an earthen entrenchment had been built. He had expected that the sepoys would go to Delhi to join the mutiny there but instead the local “ruler”, Nana Sahib, persuaded them, using money from a treasury that the British had left in his care, to attack the British, Europeans and Anglo-English in Cawnpore. Until then Nana Sahib had been very friendly to Wheeler and his officers. The boats were over-crowded, stuck in the mud, and the thatched roofs laced with hot charcoal. As soon as everyone was on board they were fired upon from the opposite bank. Many were killed by Nana Sahib’s men as they jumped from the boats and tried to get back to the shore. Those who made it to shore were separated. The men were lined up and shot and the women and children taken back into Cawnpore and later housed in what became known as the Bibigarh. The women were scantily clad for they had given up most of the material from their dresses and petticoats to dress wounds. Over 200 women and children were crammed into the Bibigarh where the conditions were very bad and it was reported that 25 died in one week from dysentery and cholera. Mowbray stated that lynch law prevailed after the British retook Cawnpore and found the well full of bodies. Any sepoys who were captured were hanged for rebelling and also for not stopping the massacre at the Bibigarh. Many Indian civilians were also killed for not doing anything to save the British women and children. One of the memorials to the Wray family at Aysgarth church states that Mrs Fraser’s husband also died during the mutiny. But there is a report that he survived, rose to the rank of General, married two more times, and had nine children5. 1. Information about the Siege of Badajoz mainly from Wikipedia. Lt Fawcet is listed on Glosters Tripod.com as being killed during the storming of Badajoz on April 6. 3. Also known as India’s First War of Independence, the Sepoy Rebellion, the Revolt of 1857 and the Uprising of 1857. 4. Mowbray Thomson, The Story of Cawnpore, R Bentley, London, 1859, https://archive.org/details/storycawnpore00thomgoog. His account about Mrs Fraser is on pages 26-28. 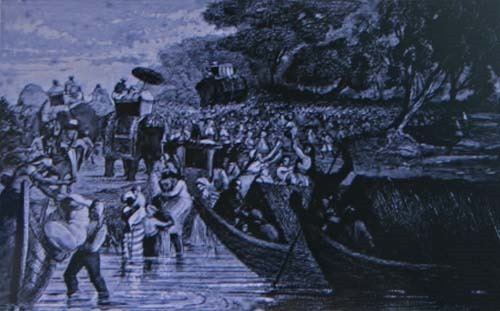 Picture of the scene at Sati Chaura Ghat on June 27 1857 is from Thomson’s book. Several members of the Wray family served in India as can be seen from the memorials. That on which Ann Fraser is listed as the “Heroine of Cawnpore” is under the East window (below) in the Lady Chapel and is hidden behind the altar table. 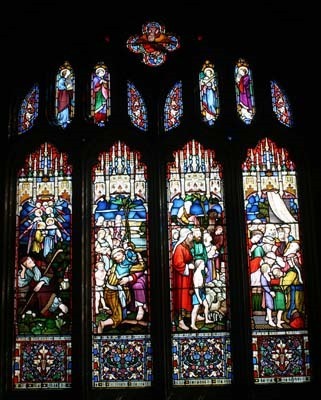 The window illustrates the life of Jacob. Brass plate under East window: To the memory of George Wray of Thoralby Town Head in this parish Esquire who died 14 October 1806 aged 50 an Ann his wife who died 17 March 1795 aged 28 also of their eight sons and the wives and children who died before 1871 of such of their sons as were married namely 1. George Wray of Cleasby in this county Captain Bengal European Regiment born 1785 died 1838, Isabella his widow died 1848 and their third son Christopher Wright WRAY H.M. 87th Royal Irish Fusiliers Surgeon born 1825 killed by an avalanche in the valley of Wardhum in Cashmere 1853 unmarried. 2. Thomas WRAY born 1785 died in infancy. 3. Thomas Fawcet WRAY Lieut. H.M. 7th Fusiliers born 1786 killed at the storming of Badaios 1812 unmarried. 4. Jonathan WRAY born 1787 died 1801 unmarried. 5. John WRAY born 1788 died 1810 unmarried. 6. James Taylor WRAY of Cliff Lodge near Leyburn in this county Esquire born 1790 died 1845 and Sarah his first wife died 1827 also Julia his widow died 1860. 7. Septimus WRAY of Brixton in the county of Surrey M.D.M.R.C.P. Lond. Born 1792 died 1869 his first wife Frances died 1846 and their daughter Fanny Julia born 1831 died 1852 unmarried. 8 Octavius WRAY Surgeon Bengal European Regiment born 1793 died at Agra in the East Indies, 1836, Sarah his widow died 1870 and their eldest daughter Anne Fawcet “The Heroine of Cawnpore” wife of George William Fraser 27th Bengal Native Infantry died at Cawnpore in the East Indies 1857. Brass plate: Here lies the body of George WRAY of Thoralby who departed this life January the 14th in the 78th year of his age and the year of our Lord 1785 also of Jane his wife who departed this life April 16th in the 80th year of her age and in the year of our Lord 1788. Brass plate: In memory of Jonathan Wray of Easthome who died on the 17th January 1780 also of Mary his wife who died on the 28 November 1803. Tablet: In memory of George Wray Esq of Townhead House Thoralby who died October 14 1806 aged 49, Anne his wife who died March 17 1795 aged 27 also of their sons Thomas Fawcet who died an infant December 13 1785, Thomas Fawcet killed in action in Spain April 6 1812 aged 25, Jonathan who died April 26 1801 aged 13, John who died February 18 1812 aged 23. This monument was erected by George, James, Septimus and Octavius surviving sons of George and Ann Wray. Tablet: In memory of Jonathan Wray late of Eastholme Gent. Who died 1 august 1811 aged 51 years. Also in memory of Agnes widow of the above who died January 21 1843 aged 82 years and of their only child William Robinson Wray of Eastholme who died May 2nd 1861 aged 70 years. Brass plate: To the Glory of God and in memory of Melesina wife of George Octavius WRAY formerly solicitor and Magistrate of Police in Calcutta in which city she died on the 23rd day of July AD 1860. This brass is also in loving memory of the George Octavius Wray LL.D. formerly of Calcutta afterwards of Hestholme in this parish and of the Inner Temple, London. Barrister-at-Law. In 1872 he took Holy Orders and was Vicar of Brockenhurst in Hampshire for 8 years. He died at Surbiton in Surrey on the 18th March 1893 and his remains are buried outside this window. The Lady Chapel was furnished by members of the Wray and Winn families.